Čas hitro mineva. Če tega nekako sam ne opaziš pa te na minula leta opozorijo odrasli otroci. Le kdaj so tako zrasli, saj so se še pred kratkim držali mame za krilo. Se tudi vam dogaja, da leta kar nekako zbežijo? Ob obilici dela, opravkov in raznih obveznosti pa pozabimo uživati v življenju. A nikoli ni prepozno! Napis na digi štampiljki (Bugaboo) me je pritegnil in mi dal misliti. Zato sem jo tudi izbrala za tokratni izziv pri Creative Moments. - Noor design: ATG, Jan.
Razgibana voščilnica, ki že "diši" po pomladi. Ja, čas res neverjetno leti in prav zato vse bolj poskušam uživati v trenutkih in zadnje leto mi je to dobro uspevalo. Tvoja voščilnica pa je lep opomin na to. 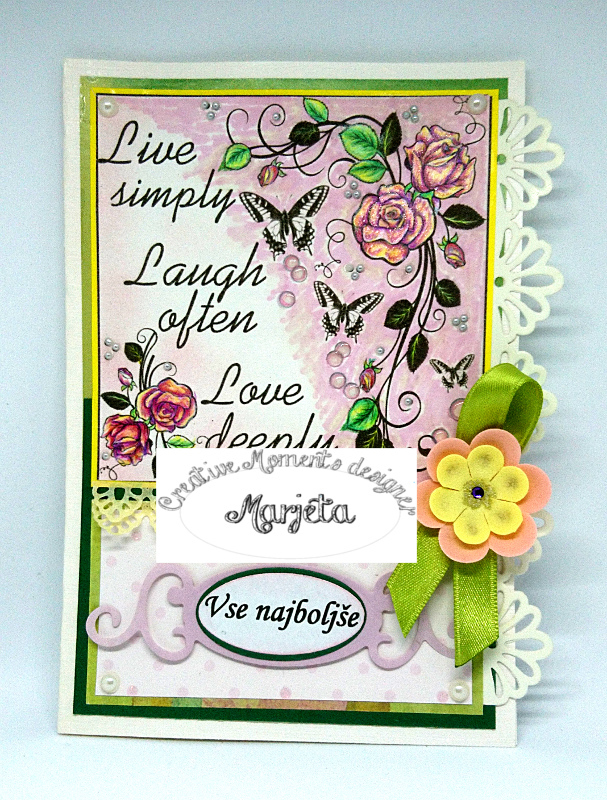 Beautiful card with wonderful sentiments! So bright and happy! Thanks for sharing it with us at Penny's Paper-Crafty Challenges! Lovely card and I love the sentiment! Thanks for playing along with us at our present challenge at Kreativ-Tanten and good luck! Hope you will join us next month again. Really fantastic card! I love all the colors! Thanks for joining us at Kreativ-Tanten-Challenge! 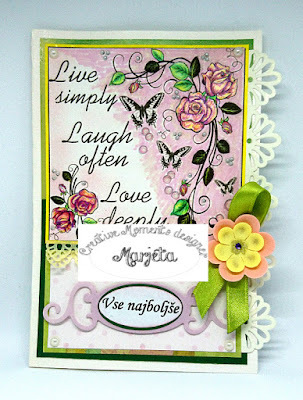 Such a pretty card Marjeta, lovely colours and fabulous border. Thanks for joining us at the Creative Aunts Challenge. This is stunning and beautiful, Marjeta. Thanks so much for stopping by to share your talents with us. Have a blessed week. What a gorgeous card. We're so blessed that you joined us with your wonderful art last Challenge. We would like to invite you to link with us again in our current Challenge at Word Art Wednesday. Leaving some inspiration from the Word of God in John 4:14 n which Jesus said, "But whoever drinks the water I give him will never thirst. Indeed, the water I give him will become in him a fount of water springing up to eternal life." Have a wonderful and blessed week.